So last Thursday evening I was in Topeka, KS for dinner. 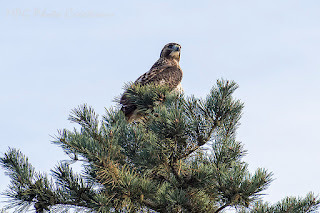 I had just parked the car and a Red Tail Hawk flew overhead and landed in the tree in front of me. It was the closest I had ever been to one so I had to take some shots, fortunately I had my camera. It had it's back to me at first but I slowly made my way around the tree and it finally turned to look at me without flying off and this is one of the shots of that.